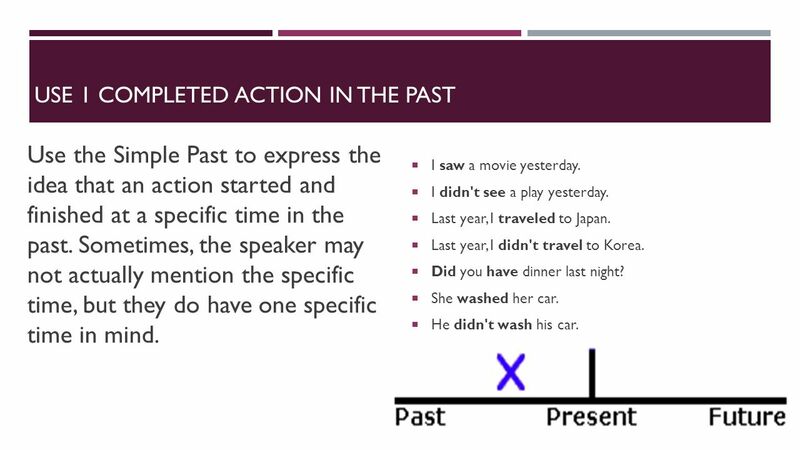 Use the Simple Past to express the idea that an action started and finished at a specific time in the past. Sometimes, the speaker may not actually mention the specific time, but they do have one specific time in mind. I saw a movie yesterday. I didn't see a play yesterday. Last year, I traveled to Japan. Last year, I didn't travel to Korea. Did you have dinner last night? She washed her car. He didn't wash his car. 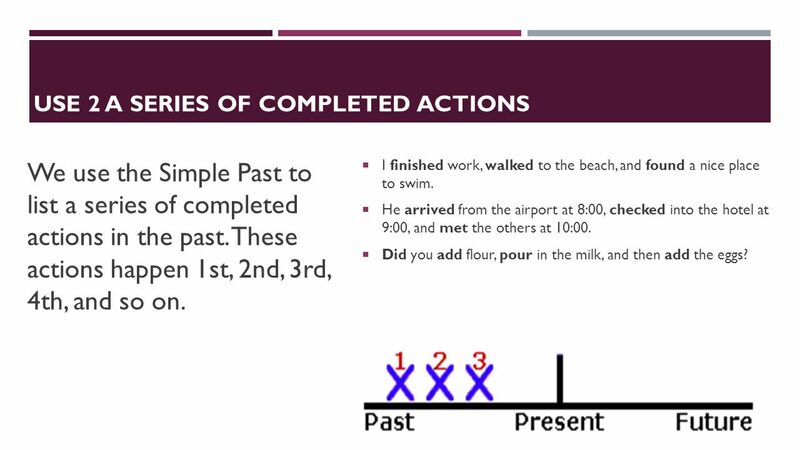 We use the Simple Past to list a series of completed actions in the past. These actions happen 1st, 2nd, 3rd, 4th, and so on. I finished work, walked to the beach, and found a nice place to swim. He arrived from the airport at 8:00, checked into the hotel at 9:00, and met the others at 10:00. Did you add flour, pour in the milk, and then add the eggs? 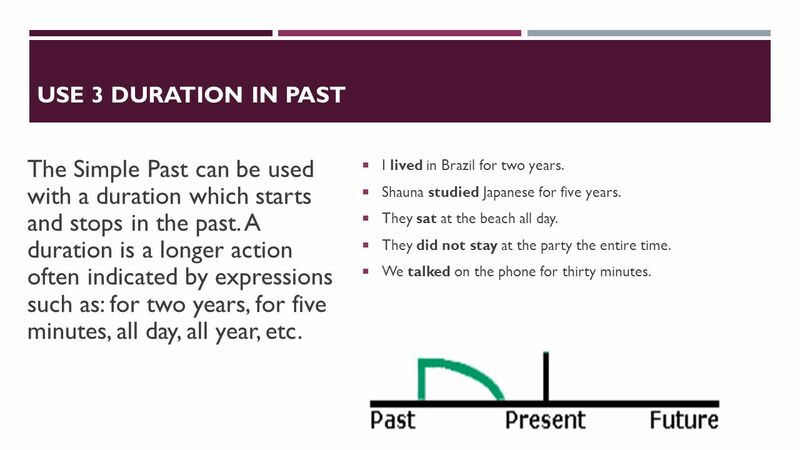 4 USE 3 Duration in Past The Simple Past can be used with a duration which starts and stops in the past. A duration is a longer action often indicated by expressions such as: for two years, for five minutes, all day, all year, etc. I lived in Brazil for two years. Shauna studied Japanese for five years. They sat at the beach all day. They did not stay at the party the entire time. We talked on the phone for thirty minutes. 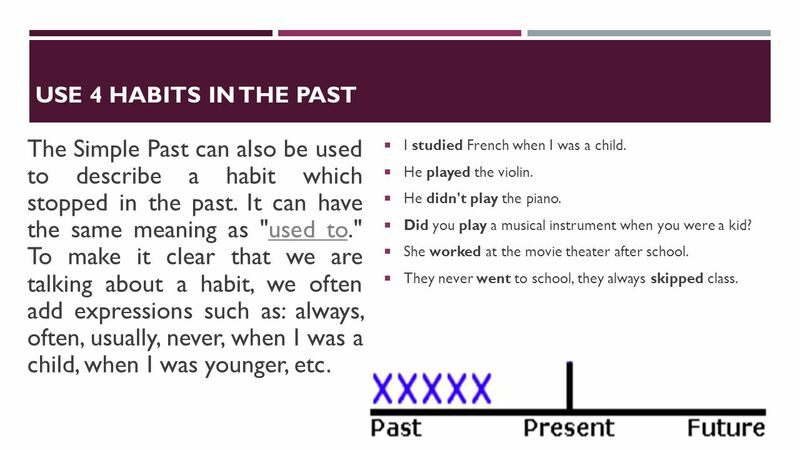 5 USE 4 Habits in the Past The Simple Past can also be used to describe a habit which stopped in the past. It can have the same meaning as "used to." To make it clear that we are talking about a habit, we often add expressions such as: always, often, usually, never, when I was a child, when I was younger, etc. I studied French when I was a child. He played the violin. He didn't play the piano. Did you play a musical instrument when you were a kid? She worked at the movie theater after school. They never went to school, they always skipped class. 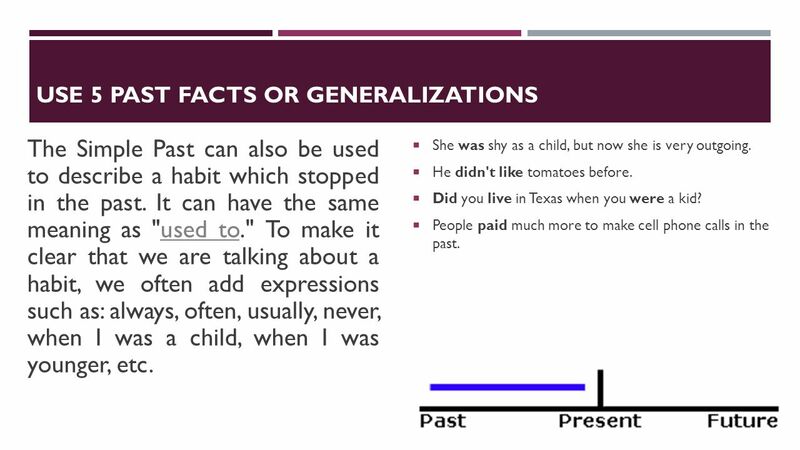 The Simple Past can also be used to describe a habit which stopped in the past. It can have the same meaning as "used to." To make it clear that we are talking about a habit, we often add expressions such as: always, often, usually, never, when I was a child, when I was younger, etc. She was shy as a child, but now she is very outgoing. He didn't like tomatoes before. Did you live in Texas when you were a kid? People paid much more to make cell phone calls in the past. 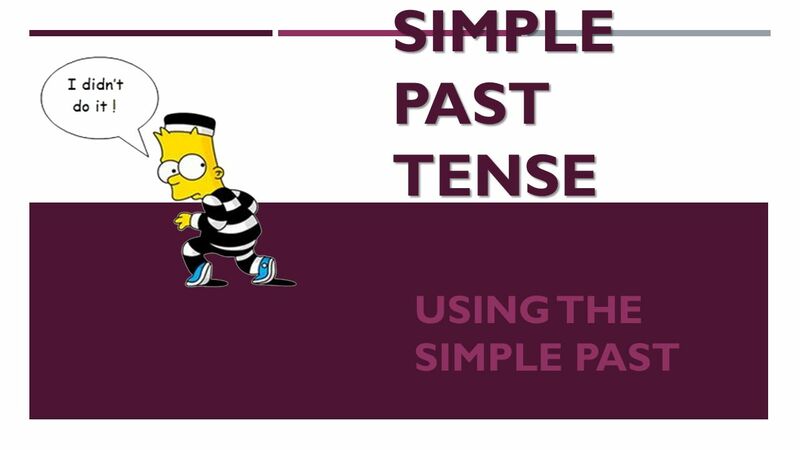 Download ppt "Simple Past Tense Using the simple past." Tense agreement in conditional statements My father wished he could have finished high school when he was young, but he had to go to work to support his. Reviewing Verb Tenses TEACHER : PEPI FIDIA, S.Pd. Reviewing Verb Tenses References © 2001 by Ruth Luman. Present Perfect Tense Present Perfect Tense is one of the most often use in all English Grammar Tenses and yet one of the tense that most difficult to.